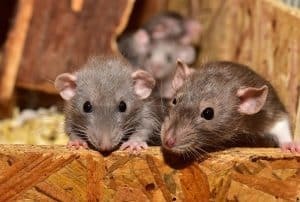 Mice are very annoying vermin which can threaten the safety of you and your household. You should catch it and dispose of it right away. It’s easy debating and talking about it. It’s also easy saying you should catch it. But there’s one very important question we need to ask ourselves: how to catch a mouse, exactly? This can be done in numerous ways, and some include keeping the mouse alive. The others use traps that don’t keep the mice breathing. Which way you choose is up to you. You can do everything and more with this handy article, though! There are many possible ways a person can catch a mouse. This is because people have come up with various ways to suit their needs. After all, mice have been a problem for centuries. It’s no wonder that you can choose the method of getting rid of them today. If you want to catch your mouse and kill it, then you can do so with many traps. These are glue traps, electronic traps, and snap traps. And if you want your mouse to stay alive, homemade traps will help. You can also opt for humane mouse traps. The steps to catching a mouse are all the same, regardless of what trap you choose. First, you will need to get your trap and unpack it. Be careful not to hurt yourself. Now you should find the place where the bait is supposed to go. Open it and simply put the desired bait in place. Place the trap somewhere where you’ve seen traces of mice. These traces are most often mouse droppings. Once you have caught the mouse, it’s time to get rid of it. If you’ve used a lethal trap you can do this by taking some gloves and throwing the mouse away. You can also throw the whole trap away. If you used a humane trap, then you should release your mouse. Do this by driving far away and setting it free. Mice are small animals which can cause a lot of damage. Having one in your house definitely isn’t healthy. You shouldn’t allow it to stay inside for long once you notice its existence. It’s fairly easy to notice if you’ve got a mouse living with you. Mice leave droppings everywhere, gnaw at packages with food, and tend to chew through construction like wires. You can catch a mouse in many ways, depending on what you want with it. If you’d like to dispose of the rodent, then you can buy some kind of a trap. Lethal traps come in various shapes and sizes. For example, you can buy a snap trap, or opt for the glue trap. Glue traps are convenient because they’re very easy to use. All you have to do is place one in an area where you’ve noticed rodent activity, and wait for the mouse to step in it. Then simply pick up the trap and throw everything away. If you’re aiming for a reusable trap, then you might want to choose the snap trap. It’s easy to set up; all you have to do is move a few bars around to set it up properly, and then the place is alongside the wall. Then, when the mouse you catch the mouse, you can dispose of the trap and it entirely. Or you can raise the kill bar and throw just the mouse away. You can use the trap again with no issues. Another option for the reusable traps is the electronic trap. This one has a lid you can lift to leave the bait and an on button. All you need to do is place is next to the wall, with the entrance hole closer to the wall. These traps even have a handy indicator light which let you know everything is running smoothly. When you catch the mouse, you simply open the lid and throw away the contents of the trap. These are great if you are kind of skittish about mice, as you won’t have to touch or see it get rid of it. On the other hand, there are nonlethal traps which you can use. They help catch a mouse alive. Then you can release it into its natural environment. These are a great option if you don’t want to kill this small creature. It does not know it is trespassing. It was only looking for food. These kinds of traps can be homemade or store bought. The homemade kind takes only a few moments of your time, and generally, don’t require a lot of effort. The most popular of these is the one with the tube and a bucket. 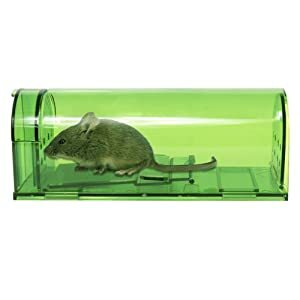 You’ll need to get a tube which is weak enough to collapse under the mouse’s weight, yet strong enough to stand on its own. A paper towel tube usually works. You should flatten one side of the tube with your fingers, so it can stand on the counter or table. You should balance it on so that one part is hanging off the table or counter. On that part, you should put bait. The bait can be anything high in protein. It’s easier if you make the trap with peanut butter. There is no danger of it falling from the trap. Now you should place a bucket right underneath the tube. All that’s left is to wait. The mouse will smell the bait and go into the cube, then fall into the bucket along with the tube. If you don’t like making traps by yourself, then you can purchase one at your local store. The most common one is the Cube trap, which is basically a plastic container with a one-way door. You put the bait inside and place the trap in the mouse activity radius. Whichever way you choose, remember that releasing the mouse is as important as catching it. You should drive at least 5 miles away from your house to prevent the mouse from coming back. Choose a rocky or woody area. It will have where to hide from predators and other inconveniences. It will be useful before it gets familiar with the new are. If you feel like enhancing its chances for survival, you should leave food out for the mouse. Do this the first few days of its new home. As you can see, there are many ways you can catch a mouse. One thing is common for all of them, though. It’s essential to thoroughly clean your house after the mouse is gone. Swipe away all the droppings and hair, dispose of the nest, and wash your floors and counters. This will get rid of the mouse scent and prevent more mice from infiltrating your home. This may seem like an unnecessary step, but if you don’t do it, be sure that you’ll have more mice in your house very soon. Lastly, don’t give up hope. Patience is key to a successful mouse hunt. They’ll need time to establish the safe areas in the home and to get acquainted with the traps you’ve set. At first, they’ll be wary and distrusting. If you don’t move the traps, they will see them as the consistent part of the environment. They’ll enter full of confidence and you can trap them rather quickly. It usually takes them around two or three days to survey the traps. So it’s pretty safe to move them to a better place if you still haven’t caught anything after a few days. Remember that bait plays a crucial part in this operation. Also that you should apply it without getting your scent on it. Catching a mouse is generally a pretty quick process if you do it properly. The biggest mistake people make while mouse hunting is starting slow. This means that they put a trap or two, or maybe three for the whole house on the first night. The thing is, you’ll have a much better chance of catching the mouse if you buy many traps. Strategically placing them is the key to catching mice fast. You have to know that mice are animals which build nests and don’t stay too far away from them. The only reason a mouse will need to leave the nest is to get some food. During nights, they can move around and explore. This is when you’re most likely to catch them. There’s a 100 feet radius which they will move in, always staying careful to be able to return to the nest. Usually, they won’t need to explore the whole radius. Instead, they’ll move at about 30 feet away from the nest. People usually think that it’s a smart idea to leave the mouse traps all over the house, in the middle of the rooms. Half of this statement is actually true. Yes, you should set the traps in the whole house. (Especially on the first night of the hunt). But you should leave the traps next to the walls. Particularly, the hole of the trap should be closest to the wall. They feel that it’s safest to move alongside the wall. Remember to check your traps often. Sometimes a mistake can be made while baiting the trap, meaning either too much or too little bait can be put. Putting too much bait can result in the trap not working properly because the bait is likely to trip the trap. On the other hand, too little bait is less likely to attract any mice. Sometimes it can even happen that you find an empty trap with no bait in it. This is a sure sign that you’ve probably put too much bait, and so the trap couldn’t work. Use food which mice like (like hazelnuts, chocolate, cheese, peanut butter). Overall, it should take up to 3 days to catch a mouse. If you’re lucky, you’ll be able to do it in even less. This is generally the time a successful hunt lasts, and you can’t do much to change that. Some people are really impatient and don’t want to waste their time catching mice. You can always call a professional to take care of your problems for you. The next question we have to pose ourselves is how we know we’ve gotten rid of all the mice in our home. Keep an eye open for more droppings and food and construction chewed. If there are none of this signs for several days, it’s pretty safe to say that you’ve disposed of all the vermin in your house. Once this is the case, don’t forget to clean your house. The only thing more annoying than one mouse is more mice. You may have little to no luck with catching your mouse. And then you might think that the mouse is too smart for the trap and that it senses the danger. Are mice actually that smart? The short answer is no. We tend to give animals human traits and think of them as smarter as they actually are. Especially in situations like these. The truth is much simpler, though. Mice have a very keen sense of smell. The more likely possibility is that you’ve ruined the trap by putting the bait in with bare hands. This means that the bait is now contaminated with the smell of the mouse’s enemy. Would you go near food your enemy has touched? Well, neither would the mouse. This is why it’s important to wear vinyl, rubber or latex gloves when handling mouse bait. Another issue could be concerning scent of a different kind. If you’ve used the trap before, and a mouse has died in it, the smell of death could be strong for other mice. This is why it’s very important to check your traps often and dispose of the dead mouse as soon as possible. We’ll perceive the trap as clean but the other mice will definitely smell their dead comrade. That doesn’t mean that they’re aware that the trap can kill them. They just realize that their fellow mouse has died there. Or that a human has been near the trap. This is enough to make them avoid the trap.You can solve this problem with humane traps because there will be no smell of death. Quickly release the caught mouse and set the trap up again. Another mouse is likely to quickly enter the trap with no hesitation. It will smell the presence of another mouse or its urine. Remember that proper trap placement is also very important. If you set a mouse trap in the areas where the mice don’t pass by, of course, they won’t enter the trap. This has nothing to do with them being smart, just with you not properly placing the traps. Make sure that your traps are always right next to the wall, as that is the most likely place a mouse will pass. To increase your chances of success, place many traps all over the house because you’ll cover more ground that way. If you’re having serious trouble, try using glue traps, as they are more subtle and a mouse is less likely to see them. Sometimes even those traps where the mouse needs to enter through a tunnel prove to be more useful. This is because the mouse will naturally look for a place to hide. Most importantly, don’t give up. No matter how smart the mouse may seem, remember that you are smarter and it is just a rodent. It’s bound to trip up eventually. If it doesn’t, try calling a professional. Mice aren’t fun to have around the house because of all the damage they can make and the bacteria they can leave. This is why catching them is crucial. That doesn’t mean that you need to kill them, though. This creature is simply following its survival instincts; it had no intention of harming you or your family. That’s why there are ways to catch a mouse without hurting it. The most effective one is to make a mouse trap for yourself. A homemade trap works fairly easily. First, you have to make it. You can make a lot of different homemade traps. Some example has been provided later in the article. Then you have to put some bait. Find the place where the bait is supposed to go. Put it there. Later, check the trap frequently to see if you caught the mouse. When you finally catch it, take it far away from your home and release it into the wild. Among many humane traps you can make, this is the simplest one. On top of that, it works like a charm. You’ll want to start by getting some kind of a tube which the mouse can fit in but which won’t support its weight. A paper towel tube will surely do the trick. Now, you should flatten one side of the tube. This will allow it to stay in place when you set your trap. You can do this by pressing in a side of the tube with your fingers as they run down it. You should place the tube on a table or counter. Don’t choose a place that’s too high up. Instead, a height of few feet will do. But make sure some free floor space is available under the tube. Place the tube so half of it isn’t on the counter. The next thing you’ll need to do is grab some bait. Peanut butter will work fine. Smear it inside the far end of the tube (the part which isn’t on the counter or table). Sometimes it can be hard to balance the tube and keep it in place. If this is the case, it’s advisable to get some tape to help you. Make sure to tape it lightly, so the tube will still collapse when the mouse enters the tube. You’ll also need an empty bucket or trashcan. Place this right next to the table or counter, below the hanging part of the tube. The way it works is- the mouse will smell the bait and go for the peanut butter. Then, after some time, the mouse will enter the tube. The whole thing will collapse and fall into the bucket. The mouse will still be in it. Remember to frequently check your trap. Sometimes adjustments will be necessary, like re balancing the tube or resetting the bait. Be sure to also check the bucket. If the trap worked, you should set the mouse free as soon as possible as it will starve in the empty bucket. There can sometimes be more than one mouse in the bucket. Make sure to separate them. They will eat each other if they get too hungry. Now you’ll need to get some latex or rubber gloves. This is so that you can safely pick up the mouse and transfer it into a small container. Vinyl gloves work, too. Once the mouse is in the container, it’s time to set it free. You should release it somewhere around five miles away from your house. The ideal area is that where the mouse can hide and find food easily. A woody or rocky area will do fine. Since this area will be new to the mouse, there’s a high chance that it will die. You can increase its chances of survival. You can leave out food for it in the beginning, just until it gets adjusted. There are a few ways which allow you to catch a mouse and not hurt or kill it. The easiest one might just be to make your own trap, but that too can sometimes be annoying. If you don’t want to build your own trap, then you should definitely research some nonlethal traps which local stores surely carry. 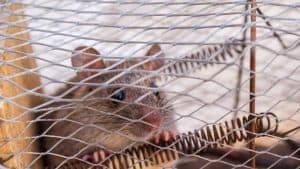 There are a few well known nonlethal traps which surely take care of the problem.Humane traps are very handy and easy to use. Put your desired bait in the place designated in the trap. After a while, a mouse will get into the trap. Then it will close it inside. It won’t be able to escape. When that happens, take it somewhere away from your house and set it free. 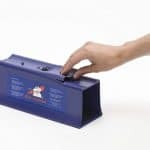 The Mice Cube is the first nonlethal trap we’ll mention. It’s a long plastic box in the shape of a rectangle. It has a one way door at one end. You simply place some bait inside and wait until the mouse enters. Thanks to the one way door, it won’t be able to go outside unless and when you release it. It’s the easiest nonlethal trap you can use. The problem is that it doesn’t provide much air for the mouse. You’ll have to check it often. Release the mouse as soon as possible to save its life. The second trap worth mentioning is the Havahart Mouse Trap which is similar to the Cube. It’s a small metal cage with a trapdoor on both of its sides. You should place the bait inside the cage. When the mouse smells it and goes after it, the mouse’s weight triggers the trapdoor mechanisms. It ends up trapped inside the cage. There’s a lot of air and room for the mouse to move around, but the trap can only catch one mouse at a time. You can go for the third option on the market, and that’s the Smart Mouse Trap. It’s basically a transparent plastic box which can be described as some kind of a combination of the past two traps. This is because of the plastic material like the Cube and the trapdoor mechanism like the Havahart, that the Smart Mouse Trap has. The mouse’s weight triggers the trap door, and it can’t get out of the trap anymore. You can lure it into the trap by the bait you have set beforehand. The mouse will have enough air and room until you get to it. Animal rights activists highly recommend this trap. Catching a mouse without a trap sounds really hard because they’re small, fast and for some people, even scary. But, believe it or not, there’s one very easy way to catch a mouse without harming it at all. All you’ll need is a glass, some peanut butter, and a nickel. Get the glass and smear some peanut butter on the inside, as bait. The mouse will smell it and want to eat it. You can use something else too, but the peanut butter is most convenient. This is because it’s easy to smear on the inside and because mice like it very much. Now that that’s settled, turn the glass upside down. You should now get the nickel or another coin. Balance the glass so one side is standing on the coin. Balance the other on the table or ground. This will allow the mouse to go in for the peanut butter. What it doesn’t know is that the coin will collapse once it enters because it will knock it over. That will allow for the other side of the glass to safely fall to the ground, trapping the mouse inside. Now you can break out some gloves and put the mouse into a container. Then simply transport it somewhere far from the house, where it will be safe. It doesn’t matter if you want to catch that darn mouse. Dead or alive, by any means possible, or unharmed, reading this article will show you how you can do it. 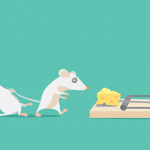 Prepare your favorite mousetrap, a piece of cheese or some peanut butter, and get to work. Remember that it won’t be easy. You can manage with some perseverance, though! 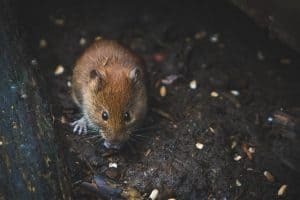 No mouse will stand a chance to your superior hunting skills after you’ve read this informative article.